To start out the day, I got on my usual bus, Route 41. As I was waiting for the bus, I kept remarking to myself how weird it was to be up this early (I’m not a morning person). When the bus showed up, I saw that the driver just happened to be one of my favorite drivers to talk to, though strangely enough I can never remember his name. So of course, we talked about random stuff, from healthcare to buses. He also mentioned that he had just 14 working days left before he is going to be finally retiring. I’ve been riding his buses for a long time, and without a doubt I know that he deserves to finally retire. I certainly hope to see a special resolution passed at the next board meeting to commend this. At Huntington TC, I got on Route 120 WB. I was a little sad to see that I was going to be riding on 276 (one of the former C-TRAN coaches), while 241 was on the 120 EB. 241 with its plush seats certainly would have been a more comfortable ride, but the ensuing connection between Pasco and Richland would have made me miss my next bus. When we left Three Rivers TC, the 120 WB had a full load, which in this definition means that every bench had an occupant, with a few benches being shared. Though “crush loads” aren’t rare on BFT routes, they’re not a very frequent occurrence. Finally, at Knight Street TC in Richland, I was able to board the bus running what is perhaps my favorite route, Route 170. The main reason why I enjoy this route so much is for the fact that it uses BFT’s MCI coaches. Today, it was 714, a 1995 MCI 102-D3SS with a Detroit Diesel Series 60 engine. Also at Knight Street TC was 710, a 1993 MCI 102-D3 with a Detroit Diesel 6V-92TA engine, running on a school tripper to Hanford High School. Just shy of an hour after boarding the 170, I was in Prosser and ready to connect to the next bus: The Community Connector. Operated by People For People, it’s a bus that runs between Prosser and Yakima 4 times a day. Perhaps the best part about this bus is that it is completely free (and just happens to be one of a very limited number of buses in Washington that is free). In Prosser, I was the only one to board. While enroute, I talked to the driver for a little bit about the Community Connector. He happened to mention the new bus that was running between Yakima and Ellensburg, which I found funny as that was the reason I was on this bus in the first place. We both agree that it’s quite something how a person can take the bus all the way from Ellensburg to the Tri-Cities. With the “Travel Washington” intercity buses, you can even get as far north as Omak, or as far east as Walla Walla (and Dayton/Waitsburg via Columbia County Public Transportation). Ridership at the start was pretty low, with just me boarding in Prosser. In Grandview, there was two more boardings, though they both disembarked in Sunnyside. Also in Sunnyside is where we picked up three more people. At the next stop in Granger is where it got interesting, with about 10 boarding (I lost count in all the shuffle). Later on in Zillah, three more people boarded. Toppenish had 5 more people boarding, though there was also 4 people who disembarked. It’s in Toppenish where riders can also connect to the “Pahto Public Passage” system, which operates on the Yakama Indian Reservation. 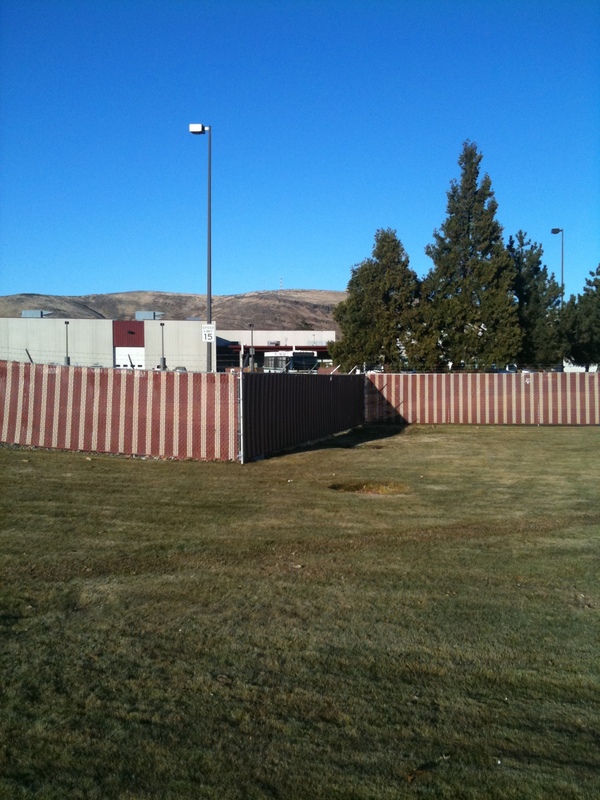 Slightly outside Toppenish at the Yakama Nation health center is where 9 people disembarked and 1 more boarded. It was also around this time where I started chatting with another rider. It just so happened that she was also going to be riding the new Yakima-Ellensburg Commuter for the first time today. I won’t lie, I was wary talking to her, mainly for the experience I had last time I saw her. (Let’s just say she’s not all there…) Finally, we made it to Wapato (the last stop before Yakima), where 1 person disembarked and three more boarded. When we finally ended up in Yakima at the Yakima Transit Center, there was about 15 people disembarking (again, I lost count). All in all, I’d say the ridership on the Community Connector is not too shabby at all. Since the Community Connector arrived at Yakima Transit Center just after 10 o’clock, and the Yakima-Ellensburg Commuter wasn’t due until 10:55, I decided to walk around a little bit. While walking around, I checked my phone and saw that it was prompting me to connect to some wifi. What caught my eye is where the wifi was coming from. Yes, that’s right. 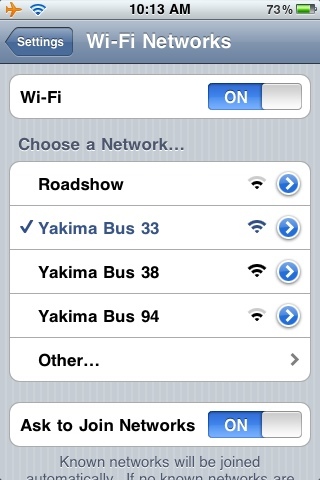 Yakima Transit buses have wifi. Um, score one for Yakima! At about 10:51, the Yakima-Ellensburg Commuter finally arrived. Of course, it’s not some special, magical bus. It’s just a plain ol’ cutaway van. But what does make it exciting is the service that it runs. I yapped on and on about it in this post, but the basic summary is this: Yakima and Ellensburg are now linked by public transportation, and it is good. In my firsthand experience on the bus, it really was good. The cutaway, owned and operated by HopeSource, was a very smooth ride. Beyond typical road noise, the only sound to hear was the subtle rattle of the farebox. It does have a wheelchair ramp in the back, but it’s nice and quiet. With room for 18 passengers (or 15 and 2 wheelchairs), capacity isn’t an issue. Or at least not yet. I overheard the driver mention that some of the morning runs were looking pretty full. I think we might be seeing that 30-passenger cutaway a lot sooner than expected. On the ride from Yakima to Ellensburg, there was 5 passengers. Apart from myself and the lady who had also been on the Community Connector, the other 3 passengers were obviously students at Central Washington University. On the ride back, it was just myself and a CWU teacher. I think it’s safe to say that CWU students/faculty will be a big portion of the Yakima-Ellensburg Commuter’s ridership. It was when we were heading back to Yakima that I found out another cool thing about the bus. Just like the Yakima Transit buses, it too had wifi on board. Apparently, there must have been a memo that I missed a long time ago, because this is certainly a huge thing for transit ridership. Some people might disagree, but I think free wifi is a great incentive to attract riders, particularly to intercity routes such as the Yakima-Ellensburg Commuter. Once back in Yakima, I had some time to kill, so without much hesitation, I decided to ride some buses. I just had to figure out how to do so. According to the information I’ve gotten from multiple sources, any person who pays a fare on the Yakima-Ellensburg Commuter is entitled to free rides on the Yakima Transit and Central Transit routes. The only problem is that not one source said how to get those rides. So, I figured, why not ask the customer service agent at Yakima Transit Center. If anyone would know, surely they would know. Yeah… no. The guy in the booth may have been the most unhelpful CSA I have ever met. To be fair, the Yakima-Ellensburg Commuter is not even a week old, so he may not have known. But, he could have made an attempt to find out at least. More frustrated than anything, I gave up on that and just paid a cash fare. The silver lining is that with Yakima Transit’s rather simple fare/transfer system, I had free rides for the rest of the day (or at least until I had to catch my bus back to Prosser). So, before I had to head back to Prosser, I decided to go around Yakima and snap a few pictures, as seen below. It’s a bit hard to see with the reflection, but I’m sure you can see most of it. Located at Yakima Transit Center, this is (supposed to be) a live bus tracker. 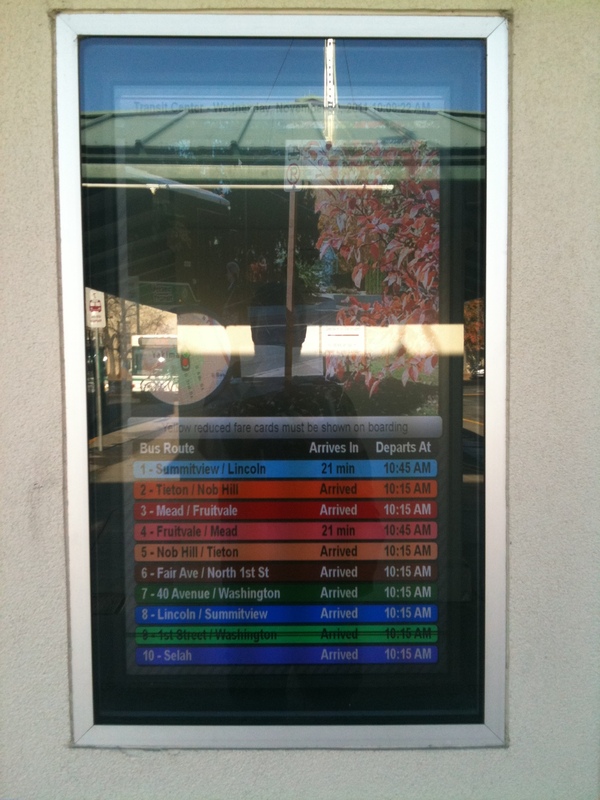 Yakima Transit does have a program to track their buses, which can be seen by the public here (requires Adobe Flash), but this display doesn’t seem to be hooked up to the system. Instead, it just shows the arrivals and departures according to the schedule. The Yakima Public Works department is where the Yakima Transit fleet is stored. Most of the fleet was out on the road, but I was still able to see 2 Orion I’s and a Gillig Low Floor sitting in the yard. I wanted to get closer and snap some pictures through the fence, but there were two guys standing by the Orion’s, and I didn’t want to call attention to myself. Public Works “Transit Center.” I use quotes because it is a transit center by definition, but Yakima Transit uses it more as a mid-route transfer point. The 4 routes that serve Public Works (3, 4, 7, and 9) arrive within the same general timeframes, but they run according to their own schedules and don’t seem to hold for rider connections. Route 10 – Selah Commuter. 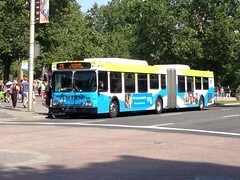 Running the route is one of Yakima Transit’s Gillig Phantoms. If you look closely, you see the destination sign is stuck on Route 9, but a paper sign in the window indicates which route it really is. Another interesting thing about this bus is that Yakima Transit isn’t the original owner. 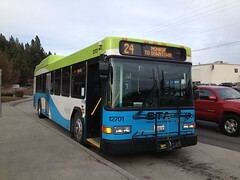 Another agency bought it brand new, and then sold it to Yakima Transit. I won’t say who originally owned it, but I will give you a hint: BFT, Island Transit, and Skagit Transit have all bought old buses from this agency. 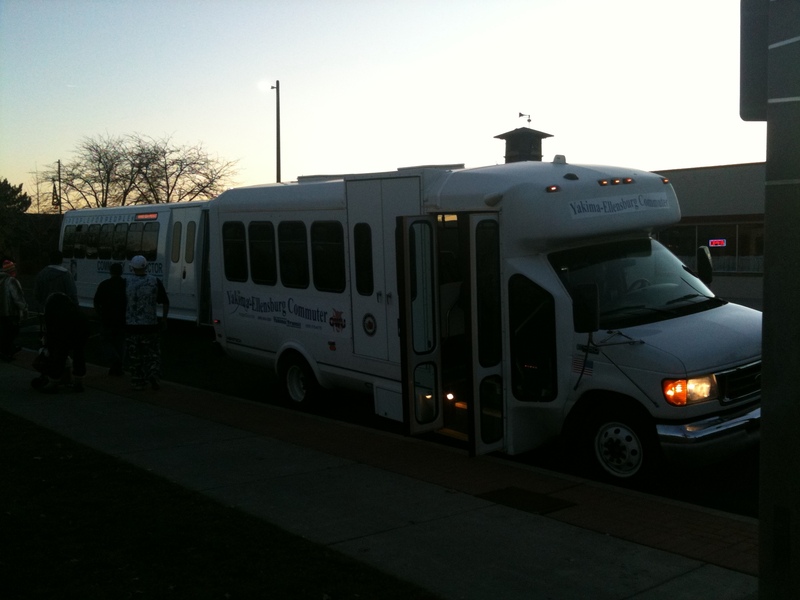 For some more pictures of Yakima Transit, you can check out some of my older pictures of Yakima Transit on my Flickr. 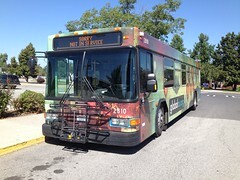 For some better pictures, you can also check out Atomic Taco’s pictures of Yakima Transit on his Flickr. At 4:10, it was time to catch the bus back towards Prosser. Coincidentally, this is also the same time that the Yakima-Ellensburg Commuter makes one of its stops at Yakima Transit Center on its way to Ellensburg. It’s good to know that this timed transfer is available if I ever decide I don’t want to have to wake up at 5 in the morning. Just as we were about to leave, the bus got delayed for a few minutes when the police showed up. Two of the riders had been creating a disturbance with some words being exchanged with a group of adolescents at the transit center. I guess the police decided it would just be best to send the riders on their way, because 10 minutes later we finally left with everyone on board. Being behind schedule wasn’t much of a problem though, because the driver was flying. I can’t say if she was speeding or not, but I know we were definitely going faster than normal. Concerned about making my transfer in Prosser, I didn’t really want to say much. By the time we left Grandview, I was the only one left on the bus, just as it had been in the morning. 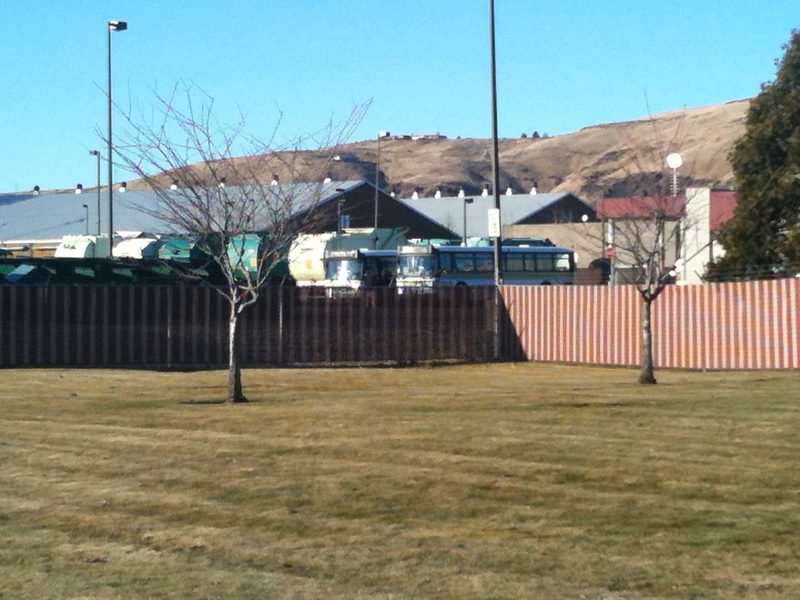 Once back in Prosser, I boarded Route 170. Not surprisingly, I was the only person on this bus. 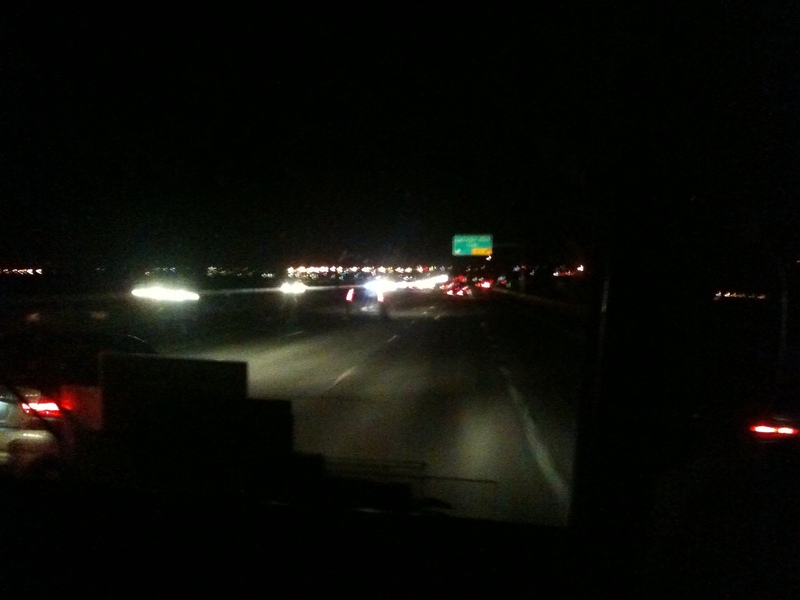 I decided to sit in the very front seat and just watch the highway as we headed towards Richland. It was kind of peaceful. As it was the last run of Route 170 for the day, it was running as the 170 Express, heading directly from Prosser to the BFT Base in the Richland Y area, with a quick stop at the bottom of the off-ramp at Exit 96 in Benton City. 6 minutes ahead of schedule, we arrived at the BFT base at 6:47. Literally as soon as I stepped off the bus, my Night Service ride showed up. The timing couldn’t have been any better, especially since my ride wasn’t actually scheduled until 7:15. It also happened to be my favorite Night Service driver. He asked me what I was doing down at the BFT base this late at night, and so I told him all about my adventure over the course of the day. I’m pretty sure he thinks I’m a little nuts, but thought it was pretty cool. The final verdict? I still like riding buses, and new transit operations are awesome. If there was something I may have missed, or if you have any questions, feel free to leave a comment below or send me a tweet to @ziggzagzac. UPDATE: As promised, here are the links for the newly updated schedules from EpicTransitJourneys.com, showing how to get from the Tri-Cities to Yakima to Seattle (or vice versa) for only $27 using public transportation! So start to finish how much time and money did it take to get from the Tri-Cities to Ellensburg? And how much to return? From the Tri-Cities to Ellensburg, the ride took me about 5 hours and 50 minutes. (I’ll have the post updated later to include links to the schedules and maps for each bus route I was on.) The cost for the ride was $5.25. When I first boarded Route 41, I paid the standard fare of $1.25 and received a transfer slip. At Knight Street TC, I showed my transfer to the Route 170 driver and then paid an additional $1 for the “add-fare” that is charged if you ride between the Tri-Cities and Prosser (though to/from Benton City is exempt). As mentioned, the Community Connector was free, and then the Yakima-Ellensburg Commuter fare was $3. From Ellensburg to the Tri-Cities, the ride would normally take about 4 hours and 30 minutes (though I spent more time riding since I left Ellensburg on an earlier bus to spend additional time in Yakima, along with the fact that Route 170 was running as an Express). The fare was the same as the first half of the trip. I should also note that when I arrived at the BFT base at the end of the Route 170 ride, I had to pay $3 for my Night Service ride. Later on, I’ll update with a published schedule from EpicTransitJourneys.com that shows all the times that you can take this multi-bus ride, and also how with additional buses you can ride from the Tri-Cities to Seattle for less than $30 (and even less with an ORCA card). So it’s cheap but definitely not very fast. I’d hope that the Tri-Cities to Seattle would be cheaper than that. I think it costs just over $10 to ride transit from Seattle to Portland or Vancouver BC (although that includes a walk across the border). I used to live in the Tri-Cities but I don’t really remember which buses I rode by number. It’s probably all changed by now anyway. You should have asked. Several years back i went and visited and just walked in, and asked if i could take some pix of the buses, and they gave me a tour. Really?! Wow… Sadly, I don’t know how much time I would’ve had to take pictures there, since I was a bit pressed for time to get back downtown for the Yakima-Prosser Connector. However, that is definitely added on the “to-do” list for next time I’m over there.